The Christmas Post Box begins on Monday, 5th of December. Pupils are invited to post their Christmas cards for delivery around the school. Please ensure the forename, surname and base number is written on each card to ensure the correct person receives the card. Christmas post is for school cards only. Primary 6 pupils will sort the cards and help Primary 1 pupils deliver the post each day. Primary Seven were rewarded with delicious hot, sticky marshmallows squeezed between chocolate digestives as a final treat during their Outdoor Learning workshop with the Forestry Commission. Their faces tell the rest of the story! Base 9 have been learning about cops and robbers. On Tuesday they enjoyed a visit from the community police, PC Lauren and Stephanie. They got to try out the handcuffs, try on the police hats, got their finger prints taken and even got to sit in the police car! Some of them were even lucky enough to put on the blue lights and siren. Base 12 recently visited Summerlee Heritage Centre to take part in a Victorian workshop. The workshop allowed the boys and girls to become historians for the day and share all that they had learned from their recent Victorian topic in class. The boys and girls were able to handle some real Victorian items, write using chalk and ink, play with some Victorian toys and even dressed the part as a Victorian. They all had a fantastic time, well done Primary 6. In aid of School and Nursery funds. 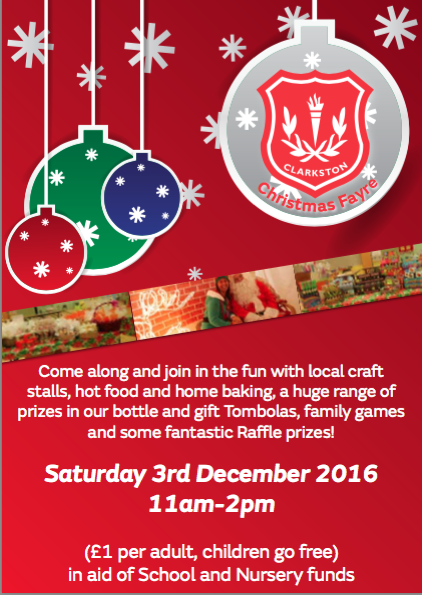 Clarkston PTA would like to remind you that they will be hosting our Christmas Fayre on Saturday the 3rd of December. The doors will open at 11am and close at 2pm. There will be a range of visiting craft stalls as well as the traditional favourites such as raffles, tombola, kids lucky dip, glitter tattoos, bottle stall and home baking. Come along and relax with a cup of coffee and delicious home baking and don’t forget to pay a visit to Santa’s Grotto before you go! The PTA would be grateful for donations to make our Christmas Fayre a terrific success! Click on the link below to find out how you can help. Our Christmas Fayre is nearly here (Saturday 3rd December) and Clarkston Primary PTA needs you to help us make it a success! Any unopened bottles for the Bottle stall. 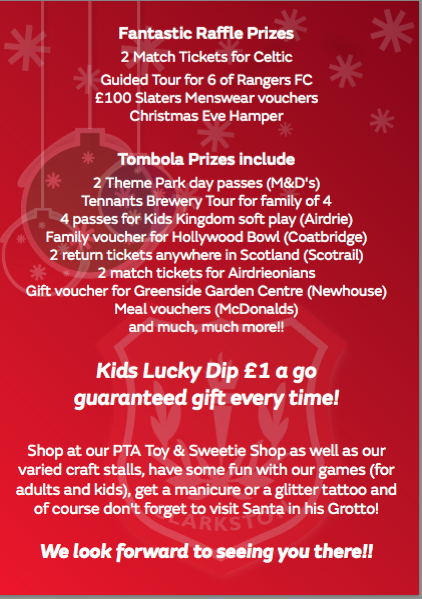 Children’s gifts (toddler age and above) for the Kids Lucky Dip. We would appreciate it if you can get donations to the school by Friday 25th November (to allow us to wrap them) although we can still take donations up to Friday 2nd December. Donations of Home baking can be brought in on Friday 2nd December – no fresh cream please! 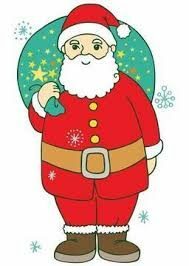 We also need an army of helpers on the day – if you can help please contact Karen Turner by leaving a message at the office, through our Facebook page or email Clarkstonprimarypta@outlook.com by Friday 25th November. This year we are holding a competition to design our Christmas Fayre mascot. All entries must be submitted by Wednesday 23rd November. Each base will pick their entry and one winner will be announced on Monday 28th November when they will receive a prize and have their mascot used throughout the Fayre! Please see separate sheet for the entry form. Generous and caring pupils, staff and parents went dotty for Children In Need. Lots of fun was had by all as pupils wore clothes and learned about Pudsey Bear and the importance of Children In Need. The day began with Base 7 pupils presenting Children In Need information to others at assembly and progressed with a variety of art and design and writing across the curriculum activities. Two caring parents also dressed up in Pudsey pyjamas and raised a whopping £100 to add to our final total. This combined with the nursery and school donations resulted in a fabulous £665.46. The day was rounded off by a mention on Children In Need. Well done to all everyone who donated to such a super cause. Thank you to the pupil council for organising the whole school event and also to Rhianna and Siobhan for being photographers for the day! Primary 6 and 7 were fortunate enough to have an assembly and class workshop delivered by child line and NSPCC. We learned all about keeping ourselves and others safe and how to tell the difference between appropriate and inappropriate actions. We know that we can speak to lots of different people to help us like parents, teachers and the police as well as contacting Childline. The children listened really attentively during the workshop session and impressed our visitors! Well done everyone!